Shangri-La’s Rasa Ria Resort is one of two luxury resorts in Kota Kinabalu. Set in a 400-acre tropical setting beside the exquisite Pantai Dalit Beach. There is a Nature Reserve with an Orang Utan Rehabilitation Centre, the only one of its kind in the region. For golf enthusiasts, the superbly sculptured 18-hole course at Dalit Bay Golf Club & Spa, designed by Ted Parslow, offers a stimulating playing experience whilst experiencing the natural beauty of Sabah. At the end of a day of diving, golf or exploring, relax with one of the many indulgent treatments at the adjacent spa. All rooms face the South China Sea, Garden View rooms are on the lower floors, Sea View Rooms are on the higher floors. Peak Season: April 2015, July – August 2015 & December 2015 – March 2016. 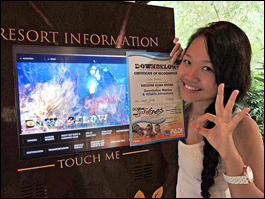 PADI Open Water Course Promo – enquire for price details! Notice: In the quest to continually improve the services and facilities at Shangri-La Rasa Ria Resort, they are presently extending the Ocean Wing sector which has commenced since November 2013. On 6th April 2015, they are proud to announce the completion of 43 Ocean Wing rooms which will gradually lead to the entire 83 rooms by the first week of May 2015. Kindly note that the resort’s management has assured that this minor renovation will be of minimal disturbance to the in house guests. In the meantime, the recently renovated Garden Wing rooms are located a considerable distance away and will be a good alternative to guests who might be sensitive to the work site of the Ocean Wing extension. The new grand lobby dedicated for Ocean Wing guests is also now open with a new Italian restaurant (Oceano – located in the New Ocean Wing Lobby) currently underway to be unveiled on 11th April 2015. The new restaurant will replace the Coast restaurant as the exclusive breakfast venue for Ocean Wing residents.